Baldwin, G. and James, R. (2010). Access and equity in higher education. In P. Peterson, E. Baker & B. McGaw (Eds. ), International encyclopedia of education. (3rd ed.). [Online]. Oxford: Elsevier Science & Technology. Available from: https://search.credoreference.com/content/topic/higher_education [Accessed 21 April 2019]. Baldwin, G, and R James. "Access and Equity in Higher Education." International Encyclopedia of Education, edited by Penelope Peterson, et al., Elsevier Science & Technology, 3rd edition, 2010. Credo Reference, https://search.credoreference.com/content/topic/higher_education. Accessed 21 Apr. 2019. The rates and patterns of access to and participation in higher education are significant policy issues in most countries. Social equity in the patterns of access to higher education is often depicted to be one of three criteria for the quality of a national higher education system, alongside effectiveness and efficiency. The literature on access and equity in higher education is thus vast, including national analyses and related policy documents, research reports, and comparative international reports by bodies such as the Organization for Economic Co-Operation and Development (OECD), United Nations Educational, Scientific, and Cultural Organization (UNESCO), and the World Bank. Contemporary research into access and equity is tightly interwoven with wider policy issues and research questions, including the purposes of higher education, the funding of higher education, the assessment of academic achievement, and the changing character of higher education delivery and patterns of teaching and learning. An analysis of the patterns of access and equity in higher education systems across the world produces a paradoxical picture of great diversity on the one hand and remarkable uniformity on the other. The rates of participation vary enormously, yet significant expansion has been virtually global over the last 50 years, driven by public demand, labor-market demand for higher skill levels, and government policies designed to improve national economic competitiveness. Despite massive growth, inequities persist in all societies, if the measure of equity is the extent to which the demographic profile of students in higher education matches the profile of the community as a whole. However, the bases of disadvantage vary according to social, economic, and political contexts. The widespread and seemingly intractable source of disadvantage is low socioeconomic status (SES), but that disadvantage takes various forms in different countries. In developing countries, poorer students have little chance of gaining entry into higher education, while in many of the developed countries they will tend to find places in the less-prestigious institutions and fields of study. The extent to which expansion has ameliorated disadvantage is a subject of intense debate, with some commentators arguing that it has actually widened the gap between rich and poor, and others taking a more positive view of recent progress. Regardless, policies and programs designed to create more equitable access appear to have had mixed success. Much of the research into access and equity has focused on solving the daunting problems of data gathering, so that countries have accurate information on the progress they are making toward the extension of higher education to all capable of benefiting from it. The work done in recent years by international bodies to develop reliable data systems for monitoring higher education is discussed in detail later. It is evident that many problems remain and there will continue to be much debate about the validity of data. Many individual countries have developed extensive databases for monitoring access and equity in their higher education systems. Australia, for example, collects and analyzes detailed information on access, participation, and completion rates, considering a wide range of factors including age, gender, SES, locality, ethnicity, and disability. This data collection has become increasingly detailed and sophisticated over the last 30 years and time-series analyses are published every year, allowing for detailed investigation of trends (e.g., Coates and Krause, 2005). Australia has the advantage of dealing with a centralized, almost entirely public system. In contrast, while there is extensive data collection in the United States, the national picture is not as easy to analyze because of the highly decentralized nature of the higher education system. The extent and quality of data vary considerably among different countries, again in largely predictable ways: poorer countries generally do not have the resources to devote to extensive data collection and analysis. A further problem is that, as different systems have developed, there has been little agreement on methodologies and definitions. Perhaps, the most basic disagreement has been over the meaning of the term higher education and particularly the place of technical education, which takes a variety of forms in different countries. Much complex, useful, work has been done by the OECD, UNESCO, and the World Bank, to establish common definitions and procedures. Thus, for example, the categorization of tertiary education into type A (theoretically based programs which are designed to provide qualifications for entry into advanced research programs and professions with high-skill requirements and which lead to the equivalent of bachelor, master, or diploma degrees) and type B (more occupationally oriented programs which prepare for direct entry into the labor market and are typically of shorter duration) has been widely accepted as a meaningful distinction, although there are still uncertainties about where particular systems should be placed. Further, the data relating to type B systems tend to be much patchier and less reliable than those for type A. In general, higher education is taken to coincide with tertiary type A programs. It has been argued by Clancy and Goastellac (2007) that entry rates should not be used at all, since, as the OECD points out that there is overlap between types A and B, the two rates cannot be added to give an overall rate. This is true if one is considering tertiary as opposed to higher education, but this distinction is not universally agreed upon. Despite the problems associated with the lack of comparable international data, some overall participation trends are evident. Martin Trow's seminal paper, Problems in the Transition from Elite to Mass Higher Education, written in 1973, has provided a valuable theoretical framework for understanding the rapid changes in higher education systems since the middle of the twentieth century. The framework defines three ideal types of elite, mass, and universal systems of higher education, defined as those in which 0-15%, 16-50%, and over 50% of the relevant age groups, respectively, participate in higher education. In an updated version of this paper (Trow, 2006), Trow argues that the United States, as the country which has led the way toward universal access, offers the best model for others to follow. Other developed, industrialized countries are at the mass stage, moving toward the universal. Although he does not deal specifically with developing countries, most of these, according to his schema, are still attempting to move from the elite to the mass stage. However, there are some notable exceptions - Russia, Chile, and Argentina - which are discussed further below. Despite this variation, the overall picture is clear. In the high-income countries (those in the OECD), expansion of higher education started after World War II, gathered pace in the 1960s and 1970s, slowed a little through the 1980s, and took off again in the 1990s. At the other end of the income scale, in poorer countries, such as those in sub-Saharan Africa and parts of Asia, the expansion started later and still lags well behind the growth in the wealthiest countries. In relative terms, this expansion appears quite dramatic but it started from a very low base, so the gap between rich and poor countries would seem to be widening. It may well be that, in attempting to increase the opportunities for their own citizens, developed countries are increasing the relative disadvantage of their less-developed neighbors. Figure 1 presents World Bank gross tertiary enrolment (GER) data which highlight the regional discrepancies in growth rates, expressed as the number of students participating in tertiary education as a percentage of the number of people in the age cohort. Figure 1 Tertiary gross enrolment ratio (GER) by region (%). The data are for 2000 or most recent year. 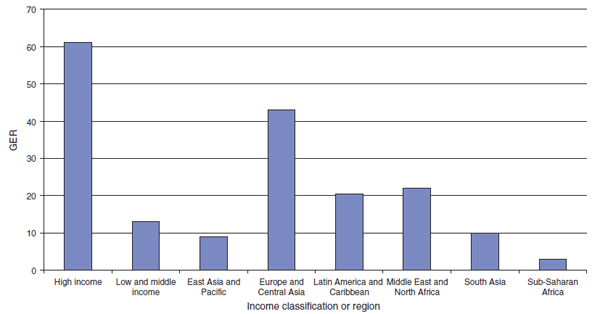 The regional classification does not include any high-income countries. From World Bank- International Handbook of Higher Education, p. 448. However, for those committed to reducing the global participation imbalances in higher education, there are grounds for optimism in the figures produced by UNESCO and the OECD, which suggest that, between 1995 and 2003, the group of middle-income nations analyzed as the world education indicator (WEI) countries saw greater expansion in their higher education systems than the high-income OECD countries - 77% as opposed to 43%. These countries are: India, China, Peru, Zimbabwe, Egypt, Indonesia, Chile, Russia, Jordan, Thailand, Paraguay, Jamaica, Argentina, Tunisia, Malaysia, the Philippines, and Brazil. Further, the UNESCO report points out that, in terms of entry rates, a number of these countries had better results than OECD countries, with Argentina, Chile, and Russia above the OECD average. These impressive rates suggest that Trow's analysis may be too narrowly focused on Western Europe and North America. One of the problems in interpreting these data, however, is that some systems (e.g., such as Argentina) have high noncompletion rates, which raises the question of whether entry into higher education is a useful measure or whether completion rates are more revealing. This is but one of the complex methodological problems which hinders research and analysis in this area. Despite the extraordinary expansion of access to higher education, social inequities in participation exist in all nations regardless of the stage of development of their systems. In a number of nations, the expansion of higher education systems from elite to mass access has placed renewed attention on the demographic composition of the student population. To some extent, the level of overall participation defines the characteristics of the equity considerations. The concern for equitable participation in higher education is underpinned by the goal of achieving individual social justice and the belief that increased participation in higher education of people from educationally disadvantaged groups is important for the long-term social and economic integration of these groups. The concept of equity is open to a number of interpretations. Equality of opportunity is often referred to as fair access without discrimination on gender, class, ethnicity, or other personal characteristics and without explicit or implicit barriers to participation, such as the cost of tuition fees and living expenses while studying. Increasingly, in the diverse systems in the mass stage, equality of outcomes has become a more salient objective, in recognition that greater equity in access to higher education may not lead to greater equality in outcomes should the personal and career outcomes differ markedly across universities or fields of study. A comprehensive consideration of equity might therefore look not only at broad access but also the type of higher education in which people participate - the nature of institution, the field of study, and the level of study - as well as retention rates, completion rates, and graduate outcomes. Though equity is often depicted in terms of individual social justice, one of the most common measures of educational advantage and disadvantage has been the patterns of representation of subgroups in national populations. The social and demographic factors associated with subgroup underrepresentation vary across nations and cultures. The community groups underrepresented include indigenous people, ethnic minorities, women, people from lower socioeconomic backgrounds, people from rural or remote areas, and people with disabilities. The position of ethnic minorities ranges from gross underrepre-sentation to significant overrepresentation, depending on the historical, social, and demographic circumstances. The extent of disadvantage associated with rural locations depends to some extent on the size of the country (James et al., 1999). Access for students with a disability has advanced much more in some nations than others (Ebersold and Evans, 2003). Women's participation in higher education remains an issue. In some countries, women are still underrepresented but in others they are clearly in the majority, although not necessarily in all fields of study or at all levels of awards. Table 1 shows the sizable variation in the UNESCO gender parity index (GPI), which is the ratio of males to females (a GPI of 1.00 indicates parity, and greater than 1.00 indicates more females than males). All of these GPIs rose between 1999 and 2004 with the exception of sub-Saharan Africa. In most nations, social class or SES is the most reliable predictor of the likelihood that an individual will participate in higher education. One German study in the 1990s (Schnitzer et al., 1999) reported that, of 100 lower social background children only 33 reached upper secondary school and only eight entered higher education. In contrast, of 100 upper social background children, 84 reached upper secondary and 72 entered higher education. &large inequalities in access to tertiary education by social origin still persist in Finland. Participation rates in university education among young students (aged 20-24) differ considerably according to the educational background of their parents. The relative chance of entering university education has remained at least ten times higher during the last decades for those coming from academic home background compared to students from less educated families. The expansion of the tertiary system appears to have narrowed the relative advantage of an academic home background to seven-fold. In many nations, the expansion of participation has done little to influence the participation share for low socioeconomic students. In Australia, for example, the proportion of low socioeconomic background students in higher education remained virtually static at close to 14.5% (against a community reference point of 25%) in the period 1996-2005, during which time the overall growth in enrolment of domestic students was 17% (DEST - Department of Education, Science and Training, 2006). In the USA, some commentators have argued that continued growth has created greater social inequality in the nature of higher education participation (Astin and Osequera, 2004), resulting from standardized entry testing used for selection purposes and rising tuition costs. Despite the significance of SES in determining the likelihood of higher education participation, by its nature it is a difficult concept to define and measure. This has a range of implications, including for efforts to broaden access and for the collection of data policy for comparison and monitoring purposes. Various approaches have been used, all with limitations, including parental occupations and educational levels, family income levels, and geographical indicators such as the zipcode or postal code of home address. Numerous factors underlie the underrepresentation of certain groups. The interrelationships between these factors are not well understood. Nonetheless, the underrep-resentation of certain subgroups in higher education is a result of the combined effects of lower school-completion rates, lower levels of educational attainment in schools thus limiting opportunities in the circumstances of competitive entry based on academic achievement - lower levels of educational aspiration, and lower perceptions of the personal and career relevance of higher education, alienation from the culture of universities, and a range of interrelated financial factors: the expense of university fees, the lack of availability of income support while studying, and the loss of potential income while studying. Some of these factors are explicit barriers to participation; others are not literally barriers but reflect that absence of family, school, or community environments that lead to the development of higher education aspiration. The imbalances in higher education participation often reflect endemic educational disadvantage that begins in the earliest years of schooling. The underrepresentation of certain groups of people has led to policy responses in many developed nations. Policies and programs designed to achieve more equitable access to higher education have been implemented at both national and institutional levels. Equity initiatives have taken a number of forms, including the removal or reduction of perceived barriers, such as scholarships to fully or partially meet the cost of fees, compensatory admission for students with lower levels of school achievement as a result of family or personal hardship of educational disadvantage, and programs described as affirmative action that focus on subgroup membership as the basis for admission. Policies for affirmative action or positive discrimination have been contentious for they conflict with conceptions that entry to higher education should be based on merit. The admission of people with lower levels of educational attainment has been seen by some to lower academic standards and to take places away from those who deserve them. Specific affirmative action programs in the United States have been successfully challenged in legal cases that have significant ramifications for public and institutional policy (Allen, 2005). The effects of equity policies are not clear. Almost paradoxically, expansion has made it difficult to assess whether gains have been made with equity. Certainly, at the aggregate level, policies appear not to have significantly reduced the persistent, proportional underrepre-sentation of certain subgroups of people. However, it is the case that higher numbers of people from previously underrepresented groups are participating in higher education in the nations with expanded systems. Whether this is an effect simply of expansion or a result of equity initiatives, or both, is difficult to discern. It is increasingly evident that there are significant limits to the capacity of policies centered in higher education to address the problems of group underrepresentation for the higher socioeconomic groups are more successful in gaining access to higher education, and to the most prestigious universities and fields, partly because of higher school-completion rates and higher levels of school achievement. Investment in schooling, including in the earlier years, is an essential element of a coordinated policy approach to widening higher education access. Against the background of great complexity and difficulty in monitoring the rapid expansion of higher education around the globe, the reasons for it are starkly clear and simple. It is a general perception that postindustrial societies require higher levels of education, and the heightened aspirations of individuals and their families in a globalized world are seen as depending on education. One of the most interesting aspects of this field is the extent to which the goal of universal higher education seems to have been accepted by most governments around the world. The rhetoric associated with the knowledge economy seems to be virtually unchallenged. Any doubts that what we may be witnessing is largely creeping (or perhaps galloping) credentialism are silenced by research which demonstrates that more education is strongly associated with increased productivity. Whether there is any limit to this acceleration remains unclear. A range of indicators has been developed to address the issue of what is the most meaningful way of gauging higher education participation in societies. As Trow points out, the use of a young-adult age group as a reference point for participation rates is becoming increasingly problematic, as more mature students enter higher education and the ideal model moves toward the concept of lifelong learning. Therefore, in addition to entry and graduation data, the OECD and UNESCO calculate the average number of years of higher education completed by citizens and projected future levels based on growth at lower educational levels. Clancy and Goastellac (2007) propose that a composite measure is needed, one which incorporates three participation and two outcome indicators. Another area in which new measures and collection systems are urgently required is transnational enrolments. As more students enter higher education programs in other countries, they can slip through the data-gathering net. In Australia, for instance, although information about international students is collected, it is not analyzed with the data relating to domestic students and is seen, probably appropriately, as not relevant to the monitoring of equity in participation within the host country. There is as yet no comprehensive system for monitoring these patterns internationally. The need is clear: a large proportion of citizens of low-income countries who gain entry into higher education do so in countries other than their own. Issues of access and equity in higher education need to be addressed globally as well as nationally and for this more comprehensive and refined databases are essential. Further, present conceptions of SES are firmly grounded in national economic, social, and cultural frameworks and a new understanding is needed of how participation rates vary by social class in a global higher education environment. Merit and equity continue to be in tension. The concept of equity in elite systems of higher education has been partly based on the meritocratic principle that certain people are deserving of higher education on the basis of untapped intellectual potential. Yet, Trow (1973) speculated that as systems moved from mass to universal participation, access would move from being a right to an obligation, and that meritocratic admissions and compensatory programs for equity would be replaced by open access and equality of group achievement, on the basis of either class or ethnicity. There is little evidence of this occurring on a wide scale, even in the most expanded systems. Instead, there is the coexistence of meritocratic and open-access admissions, with institutions adopting differing stances toward student recruitment and selection in relation to their hierarchical position within highly diversified systems - emphasis in admissions policy for some institutions shifts from the challenge of fair, meritocratic selection toward the active recruitment of students, including people with lower levels of academic achievement. Within the most expanded higher education systems, institutional diversity heightens competition for the places in the most prestigious universities: students compete for entry to what are perceived to be the best universities, while in turn the more prestigious universities compete for students with the highest level of school achievement. The importance of higher education as a positional good to some extent prevails. A relatively new layer of the higher education hierarchy has been added in recent decades, with the development of open institutions. The concept of openness applies primarily to admissions policies. To varying extents in different countries, entry is open to any student with minimal educational qualifications or, in some cases, to any individual who wishes to attempt a course, without any prerequisites. Increasingly, this concept has become associated with distance-learning procedures which, again to varying degrees, are used to minimize costs. Although supporters of distance education in its more traditional forms argue that it should be no cheaper to fund than face-to-face teaching, there is no doubt that the forms it is now taking (including increasing use of online learning) are intended to be significantly less expensive. In some developing countries, these institutions have developed into mega-universities with the largest in China (the China Central Radio and Television University) enrolling approximately 2 million students. While such programs offer valuable opportunities to many people who would not be able to engage in higher education in any other form, the status of these qualifications is generally lower than those from traditional universities and the outcomes for students patchy. High proportions of students fail to complete their courses in open institutions. Again, although the data are quite inadequate in this area, it is clear that students in these programs are more likely to be from disadvantaged groups. If there is general agreement about the desirability of universal higher education, no country seems to have found a very satisfactory answer to the obvious question of how this is to be funded. The United States, the richest nation in the world, has probably come closest, although numerous commentators, politicians, and university leaders have drawn attention to the signs of strain even in that system. There have been four main responses, which again have been strikingly consistent across the range of national systems, and which have important implications for access and equity. These are: ongoing reductions in funding per unit of student load (i.e., average expenditure per student), increasing stratification of institutional types, the development of open university programs, and privatization. All of these powerful trends are analyzed elsewhere in this encyclopedia. They will be considered here only in relation to equity issues. For it is a striking irony that, in order to increase access to higher education, governments have had to adopt policies which have the potential to exacerbate existing inequities. Decreased average funding rates would not in themselves have this effect, if applied equally. However, in many countries distribution is unequal, with some sectors of higher education being much less expensive to fund than others. This inevitably coincides with a hierarchy of prestige and, in turn, with different outcomes for students in terms of employment and earnings. Evidence from a number of countries indicates that members of disadvantaged groups are much more likely to attend less-prestigious institutions. A further effect of the inability of governments to fund higher education adequately is a very rapid process of privatization, which takes a variety of forms. Privatization involves students paying increasing proportions of the costs of their education, either directly to private institutions or back to governments in the form of upfront or delayed payments. The term can also be applied to the process of raising substantial funds from private enterprise or individuals. Ability to pay will obviously disadvantage individuals from lower socioeconomic groups, although the Higher Education Contribution Scheme (HECS) devised in Australia and adapted by some other countries does offer the option of delayed payment which is only required when a certain income threshold has been reached - that is, in theory, when the individual has acquired the ability to pay. Another form of privatization is subsidization of a set number of higher education places, while allowing individuals who do not win one of these places, to pay the full costs of their education. Unfortunately, another universal pattern seems to be that academic results tend to reflect socioeconomic differences, so that the low SES students who are more likely to miss out on the subsidized places are those least likely to be able to afford full fees. In a familiar vicious cycle, the most prestigious institutions are those most likely to benefit from privatization, in terms of attracting full fee-paying students, business support, and private donations, so the gap in quality and outcomes is likely to widen further. Access and equity in higher education remain important issues for public policy in most countries. In the more expanded systems, institutional stratification has invited growing consideration of whether equity should be considered at the level of system, institution, or field of study. A major issue for research and policy during the next decade is the development of a new conceptualization of equity that takes into account the globalization of higher education and international student flows. Allen, W. R. (2005). A forward glance in the mirror: Diversity challenged access, equity and success in higher education. Educational Researcher 34, 18-23. Astin, A. W.; Oseguera, L.. (2004). The declining “equity” of American higher education. Review of Higher Education 27, 321-341. Clancy, P.; Goastellec, G.. (2007). Exploring access and equity in higher education: Policy and performance in a comparative perspective. Higher Education Quarterly 61(2), 136-154. Coates, H.; Krause, K.. (2005). Investigating ten years of equity policy in Australian higher education. Journal of Higher Education Policy and Management 27, 35-47. Davies, J.; Weko, T.; Kim, L.; Thulstrup, E.. (2006). OECD Thematic Review of Tertiary Education. Finland Country Note. Paris: OECD. DEST (Department of Education, Science and Training ) (2006). Students 2005: Selected Higher Education Statistics. www.dest. gov.au. (accessed May 2009). Ebersold, S.; Evans, P.. (2003). Disability in Higher Education. Paris: Organisation for Economic Co-operation and Development. HEFCE (2007). Strategic Plan 2006-2011. Bristol: Higher Education Funding Council for England. James, R.; Wyn, J.; Baldwin, G.., et al. (1999). Rural and Isolated Students and Their Higher Education Choices: A Re-Examination of Student Location, Socioeconomic Background, and Educational Advantage and Disadvantage. Canberra: Australian Government Publishing Service. Schnitzer, K.; Isserstedt, W.; Mussig-Trapp, P.; Schriebe, J.. (1999). Student Life in Germany; the Socio-Economic Picture, Summary of the 15th Social Survey of the Deutsches Studentenwerk (DSW). Bonn: Bundesministerium fur Bildung und Forschung. Trow, M. (1973). Problems in the Transition from Elite to Mass Higher Education. Berkley, CA: Carnegie Commission on Higher Education. Trow, M. (2006). Reflections on the transition from elite to mass to universal access: Forms and phases of higher education in modern societies since WWII. In Forest, J.; Altbach, P. (eds.) International Handbook of Higher Education, pp 243-280. Dordrecht: Springer. Douglass, J. (2007). The Conditions for Admission: Access, Equity and the Social Contract of Public Universities. Palo Alto, CA: Stanford University Press. HEFCE (2006). Widening Participation: A Review. Report to the Minister of State for Higher Education and Lifelong Learning by the Higher Education Funding Council for England. James, R. (2001). Participation disadvantage in Australian higher education: An analysis of some effects of geographical location and socioeconomic status. Higher Education 42, 455-472. Layer, G. (ed.) (2005). Closing the Equity Gap: The Impact of Widening Participation Strategies in the UK and the USA. Leicester: National Institute of Adult Continuing Education. Naidoo, R. (2007). Higher Education as a Global Commodity: The Perils and Promises for Developing Countries. London: The Observatory on borderless higher education. OECD (2006). Education at a Glance. Paris: Organisation for Economic Co-operation and Development. Skilbeck, M. (2000). Access and Equity in Higher Education: An International Perspective on Issues and Strategies. Dublin: Higher Education Authority.